Freedom Hall’s Matinee Theatre presents performances on Tuesday mornings at 11:00 a.m. Our matinee season kicks off with the world-famous performer, Glenn Miller Orchestra on Tuesday, October 9, 2018. 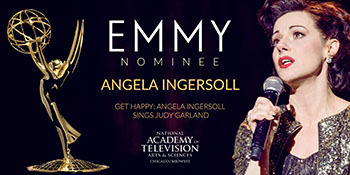 On November 13, the sensational Get Happy: Angela Ingersoll Sings Judy Garland will perform in our Nathan Manilow Theatre. 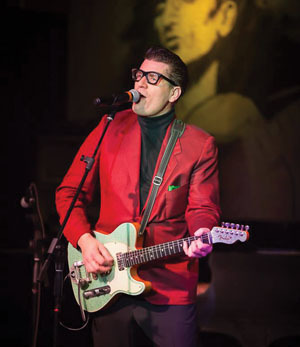 Our matinee holiday show will be The Johnny Rogers Show – “Deck the Halls with Buddy Holly” on December 4. 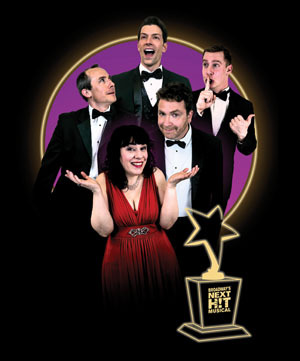 If you like Broadway music, you won’t want to miss Broadway’s Next H!T Musical on February 12. To celebrate St. Patrick’s Day, we are bringing back Switchback –Traveling Down an Irish Road on March 5. To conclude our matinee series, Higher and Higher: A Rock N’ Soul Shindig starring Chestor Gregory will perform rock and soul favorites on April 9, 2019. Matinee theatre groups and patrons of all ages are welcomed to enjoy these great performers. Matinee theatre tickets are available by calling Freedom Hall at 708.747.0580. If you would like to watch a video of the below shows, please visit our Performer Videos page. Freedom Hall’s Matinee Theatre shows are sponsored by The Chicago Dough Company. 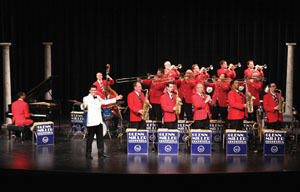 With its unique jazz sound, the Glenn Miller Orchestra is considered to be one of the greatest bands of all time. The present Glenn Miller Orchestra was formed in 1956 and has been touring consistently since, playing all around the world. 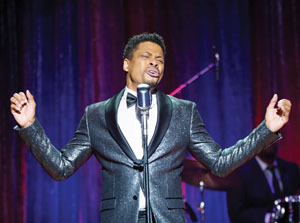 Don’t miss this Emmy-nominated performance live on the Freedom Hall stage! Presented by Artists Lounge Live. The Johnny Rogers Show pays tribute to such artists as Buddy Holly, Elvis, Roy Orbison, Jerry Lee Lewis, Ricky Nelson, Chuck Berry, Johnny Cash, and many more while celebrating the holiday season. Johnny is one the most versatile performers in America today. He was voted best of show two years in a row in Branson Missouri and was inducted into the Iowa Rock-N-Roll Hall of Fame. Johnny brings yesteryear's music and history of Rock 'n' Roll to life. The Tony Awards meets Whose Line Is It Anyway? Every song is fresh. Every scene is new. Every show is different. It’s all improvised and it’s all funny. The New York Times calls Broadway’s Next Hit Musical “Hilarious!” Time Out NY says “At last! A musical of, for, and by the people.” Master improvisers gather made up, hit song suggestions from the audience and create a spontaneous show of music, humor, and laughter. The audience votes for their favorite song and watches as the cast turns it into a full-blown improvised musical! Don’t miss the next great American musical – it could be written in your town! 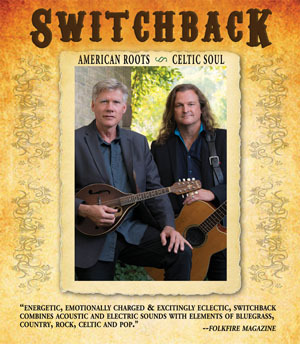 Switchback is the award-winning duo of Brian FitzGerald and Martin McCormack. Switchback draws on traditional Celtic music and original Americana songs that reflect their Irish heritage and Midwestern roots. Playing an exciting mix of mandolin, guitar, and bass, their harmonies have won them comparisons to famous duos, such as the Louvin Brothers, Everly Brothers, & Simon and Garfunkel. So relax and let their music take you Travelin’ Down an Irish Road. Higher and Higher: A Rock N’ Soul Shindig! Our Matinee Theatre at Freedom Hall has been presented top-notch acts for decades. You can order tickets online or call our box office at 708.747.0580.